1. Make use of water-saving devices. Fill a 2-litre cool drink bottle with water, close it, then pierce a small hole in the lid and place it neck-down into the soil of your plant containers. This system will trickle water into your planter and prevent waste or over-watering. 2. Place trays at the bottom of your pot plants. Trays will collect any water that is not immediately absorbed for the plant to draw in later, or to collect and re-water the plants. Reuse old saucers, in place of trays, for smaller pot plants. Mix Aquasoil into your potting mix to retain moisture for longer, reducing the need for frequent watering. 4. Enrich your soil with nutrients. Nutrient-rich soil requires less moisture. Mix organic matter such as compost, worm castings and minerals into the soil of your garden pots and containers for a nutrient boost. 5. Give your plants a double mulching. Add a feeding mulch, such as pea straw, and a second layer of mulch, such as pebbles or gravel, to prevent moisture evaporating from the soil surface. Rocket, lettuce, radish, baby spinach and spring onion all mature fast and therefore do not require too much water over their lifetime. 7. Use fewer, bigger containers. 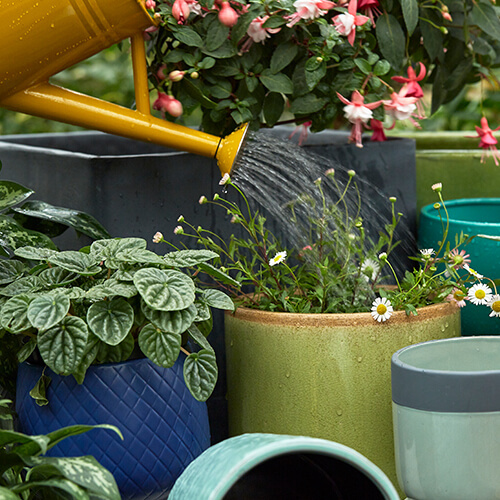 Combine plants with similar water needs together in one, large pot, so they can be watered all at once. Place hanging pots above other pots to allow water to drip down, reducing waste. Much of a plant’s moisture is lost through its leaves, so be sure to prune your plants regularly, according to their needs. 10. Only water plants when the first few inches of soil dry out. It also helps to water plants early in the morning when the temperature is cooler to prevent water from evaporating too quickly. 11. Use plant containers that are made from non-porous materials. Glazed ceramic, fibreglass, fibrestone, resin or metal are all great options to save water.